Yes, it can. In more ways than one! A few weekends ago (June 12-13th – sorry it’s taken me this long to get this posted!) 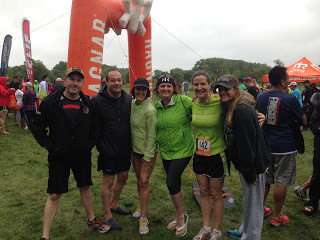 I had the opportunity to run the Chicago Raganr with a team from the Chicago area. 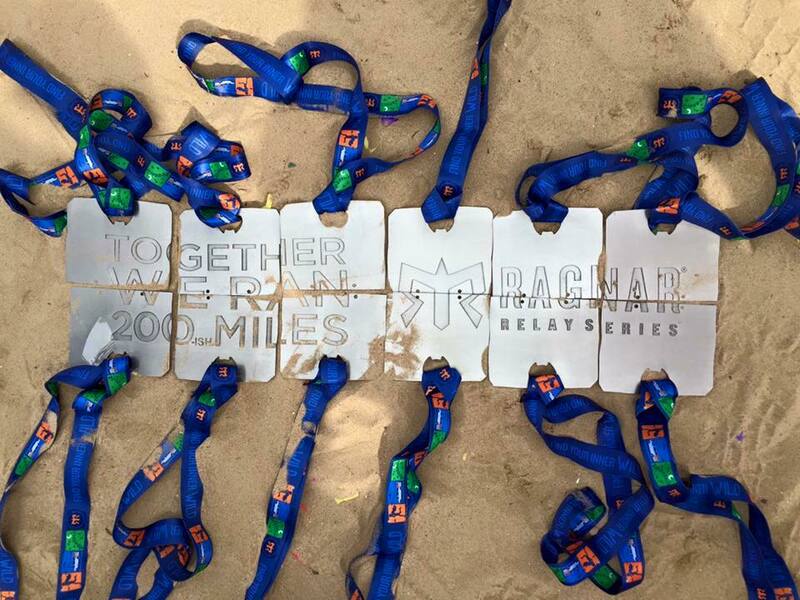 12 of us joined forces to run about 200 miles, from Madison WI to Chicago. When I joined this team, I actually only knew 1 person on the team. 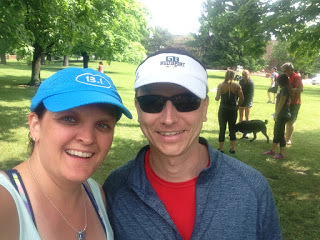 Jenn and I “met” via Twitter a little over a year ago and actually got to meet face to face last fall when I was in Chicago with the girls for the Women Rock Half Marathon. I met a few others on the team back in January when we got together for dinner, just so everyone could meet each other. But in reality, I didn’t really know any of them! 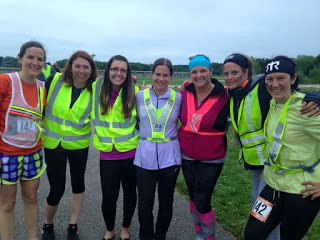 And yes, for those of you that recognize the dates of the event, I was running across the start of WI, with 11 strangers, on my Birthday! So, here I was, Thursday afternoon, driving to Chicago to meet up with people that I really don’t know, to spend 2 days in a van with them. I will admit, I felt every emotion during that 3 hours drive! Fear and nervousness for the fact that I am going to be stuck, for 2 days, with 5 other people that I really do not know (plus the other 6 people on our team traveling in the other van). 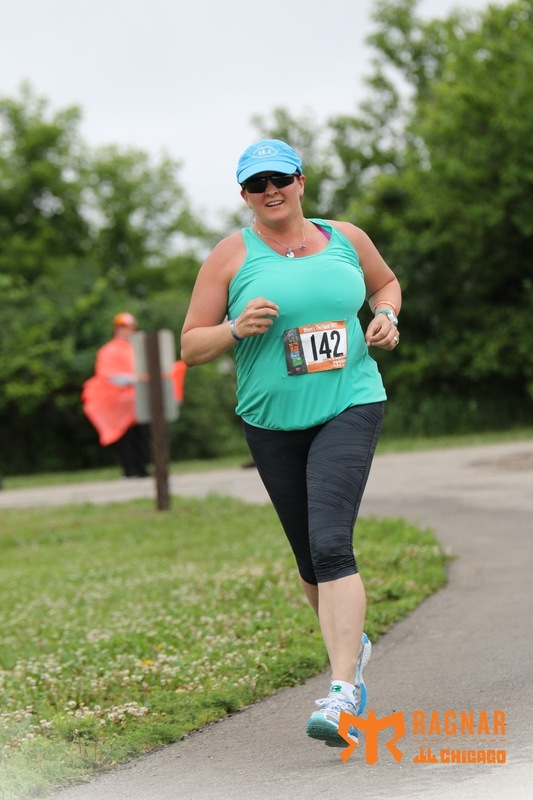 Stressed and apprehensive… would I really be able to complete all 3 of my legs with the pace that I want? Nervous for the fact that for the first time EVER, I am going to have to run at night! I am sure there were others in there too, my head was an interesting place to be that afternoon. However, all of those emotions were also mixed with excitement for this race that we have been planing since last fall. Determination to put all of my work in the gym over the last few months to the test and push myself to new limits, doing somethign that very few people have the chance to experience. It was going to take a lot of mental toughness as well as physical strength to get through the next 48 hours! Sleep did not come easy on Thursday night but I got in what I could. 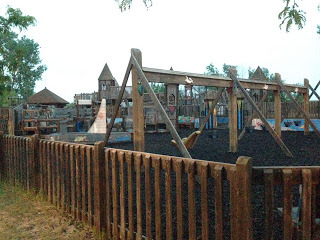 When the alarm went off at 4:15am, I momentarily forgot where I was… and then reality hit! It was time to go! Thankfully Jenn has the coffee already going and her husband was up and ready to take us over to meet the rest of the team. When we got to Michael’s to load the van, any apprehensions that I might have had vanished. 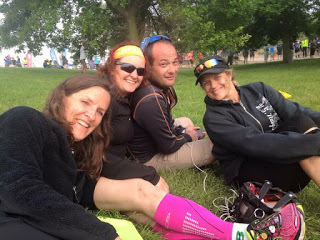 After a early morning, rainy drive to Madison, we made it to the start line about an hour before our scheduled start time, so we had plenty of time to pick up our race packet, go through watching the safely video and find the restrooms. We were hoping that it was going to stop raining before our team started but Christy didn’t get so lucky. She was going to have to deal with some rain on the first leg of our adventure. In the end, the rain let up shortly after we started out journey and it was the start of an amazing adventure! Van 1 crew ready to run! Now, I could sit here and go on for 3 days about all of the crazy adventure, the laughs, the u-turns, the lack of sleep and everything else, but I honestly don’t even know where I would start. The weekend was beyond amazing and unless you are a runner and have actually experienced a Ragnar event, you will never be able to to fully grasp the magnitude of this event! * We lost track of how many u-turns we had to make (We think our “kill” to u-turn ratio for our van was about even!) 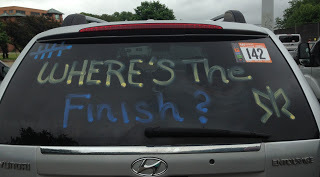 and for those that are not familiar with the term… kills refer to how many people you pass on the course… and by the end of the weekend, our van had plenty of both! * During Ragnar Weekend, real food is purely for survival and energy. 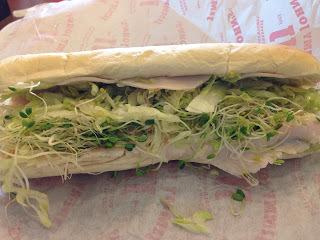 I don’t even think I tasted the sub I had Friday afternoon for lunch! Jimmy Johns to the rescue after a crazy morning! 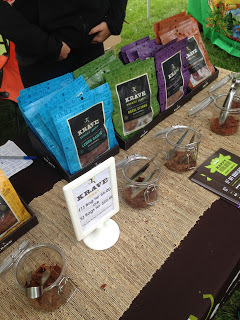 * I lost count of how many Clif bars, homemade energy bars, bottles of water, bananas, bags of beef jerky and jelly beans were consumed in our van over the 2 days! I will also never look at Oreo’s and M&M’s the same again… and did you know that Oreo’s have to be eaten in pairs? You can’t eat an odd number of them! 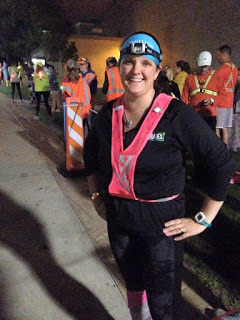 * Running at night, while a little unnerving, is actually fun… except when you have to cross a major highway (thank goodness for public safety officials at the intersections to help get you across!) But this was by far one of my favorite runs in a long time. It made me face new challenges, get out of my comfort zone and just go! ready for the night run! * You really can run and survive on no sleep! No matter how hard you try, stretching out in the back of a mini van CAN be comfortable, but I don’t know how much sleep you will get! * You might start out your adventure as strangers, but by the end of the weekend you will have created lasting friendships with these people that you now consider family! The ladies of Team Where’s the Finish! * Many people will END their birthday celebration not knowing where they are. I started mine that way! At just after midnight on Saturday morning, we were somewhere between Waukesha and Racine. I really don’t know where! 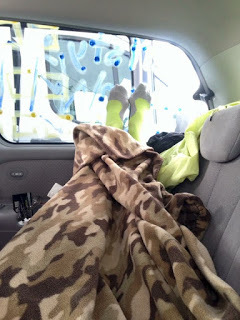 All I know is that when the sun came up on Saturday morning, 2 of our van-mates were sleeping on the ground next to the park, the rest of us were “waking up” in the van. Always nice to see a familiar face! 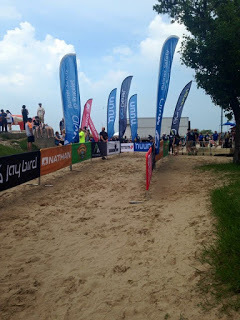 * However, I ended my birthday race weekend, crossing the finish line, on the beach, in Chicago with 11 of the greatest running friends I could ask for! I ran my entire birthday weekend and would not have traded it for anything! It was an epic weekend that I can’t wait to repeat again one day! 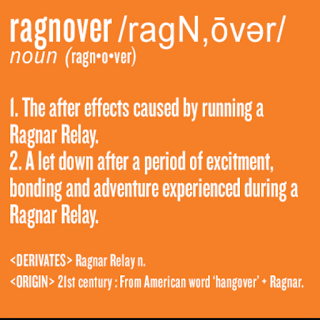 In the end, once you get home from your Ragnar adventure, you get some sleep and start getting back to “normal” life, you quickly learn that “normal” has a new meaning. The last 2 days will have changed your life. You just spent 2 days motivating, encouraging and pushing each other, you look at challenges differently, you have a new extended family, and running with friends brings out a whole new meaning. After a crazy 2 days, we all headed home, never to forget the weekend we just spent together. 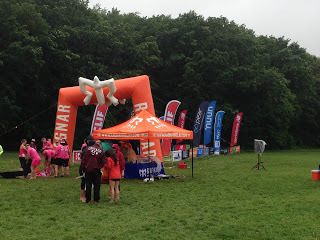 I ran 14.2 miles, walked another 15 (best guess anyway), slept for about 30 minutes and have ZERO regrets. I have gained amazing friends, look at challenges differently and am ready to take on new challenges with a fresh attitude. 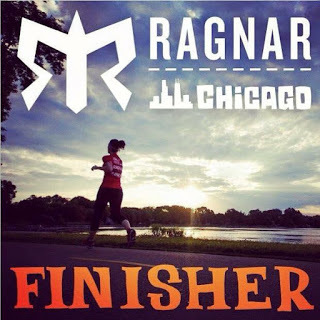 To be honest, before my Ragnar weekend adventures, I think I was stuck in a rut. I dreaded my long training runs, my heart was not in it as much as it was before. After this weekend, the fire has been restored! 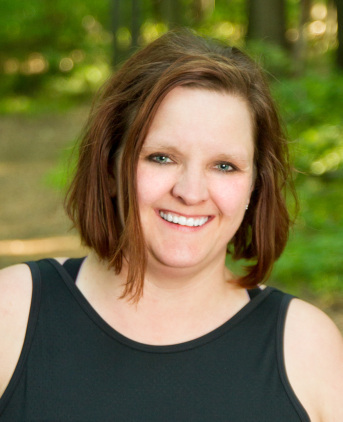 I am ready to tackle my half marathon training (Women Rock Super Starlet Challenge in MN here I come!) and am actually considering training for a triathlon (yes that means I actually have to learn how to swim!). 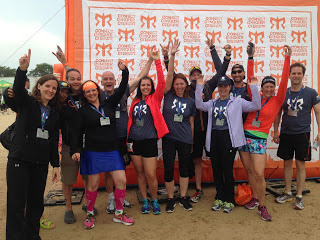 Chicago Ragnar Team Where’s the Finish – THANK YOU for an awesome birthday weekend! Can’t wait to see everyone in October! It’s time to get the family together again for a reunion, reminisce about our adventures and start planning for the next one! What have you don’t lately to challenge yourself? Go out there and do it, it could just change your life! ⟵Inside the head of a Runner!